Given point sets $Y$ and $M$, I'd like to register articulated $M$ to $Y$ without changing the edge distances of $M$. 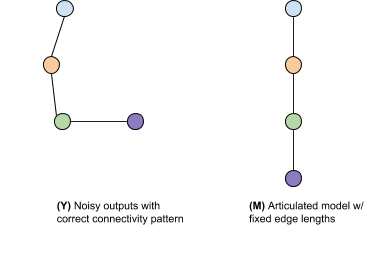 The point correspondences between $Y$ and $M$ are known and points have a fixed connectivity map. As you can see from the above sample, the edge distances of $Y$ are corrupted, and I'd like to correct them using $M$ while sacrificing some localization precision. I know ICP and RANSAC algorithms, but none of them solve the articulation problem. I'm looking for any kind of algorithms that can solve this articulated body registration problem. Browse other questions tagged transformations algorithm or ask your own question.